This audit update covered two topics: contractor oversight in the Oracle implementation process and quality assurance services provided by Tescom. 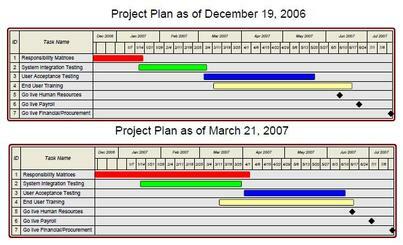 We found the steering committee had largely implemented our November 2006 audit recommendations. The steering committee also agreed to develop a process for evaluating whether requested changes in software functionality are necessary and to require direct reporting and accountability from Tescom. The Oracle implementation is behind schedule with many critical issues still unresolved and some components postponed indefinitely, which jeopardizes the go-live date and poses quality risks. Tescom provides reports to the steering committee that focus attention on the status of the project plan and schedule but do not spell out implications of the problems they identify or meaningful recommendations. Tescom reports indicate recurring problems decision making and issue resolution, as well as frequently changing system requirements.